For the ultimate in luxury - that can be surprisingly affordable - you can't go wrong with men's custom silk suits. Combining the comfort and attraction of silk with the fit and flattering look of a design tailored just for you, this can be the only dress suit you'll need for years. Why Buy Men's Custom Silk Suits? With so many high-quality suits available ready-made, to say nothing of excellent designer wear, why spend the time and money on a custom suit? Unlike the days when all men's suits were either custom made or at least tailored to fit, it can be difficult to find a good tailor at a reasonable price. Besides - don't they all look the same? The answer is a simple no. There is an enormous difference in look between a suit that is bought off the rack versus one that is made expressly for you. If you have ever seen the show Mad Men, you'll notice how slim and structured the men's suits are. A good tailor can design a suit that will emphasize your best features and hide your trouble spots. 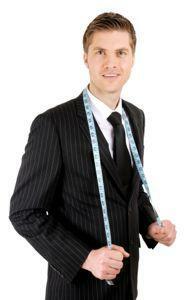 You can look taller, slimmer and better proportioned in a custom suit, with well-shaped shoulders and long legs. The differences will be subtle, but everyone - including you - will notice how good you look. There is a reason suits are sometimes prefaced with the word "power." Men's custom silk suits were always the height of luxury. Good silk is difficult to sew with, as it can be slippery or nubby, so a tailor must be highly skilled and take his time. This makes the suit more expensive. It's not just worth it because it looks and feels good. Silk, unless it's been chemically treated, is a nearly perfect fabric, keeping you cool in summer but also warm in winter. A pure silk suit is less common than a silk and wool blend, which can be a bit more practical and still has the same ability to both keep you warm and cool, as needed. Even if you're prepared to invest in a good suit, there is still the matter of finding a tailor who knows how to make a custom suit that is worth the while. This can be easier if you're in a big city like New York, as there will usually be boutique shops specializing in things like custom tailoring. You are also likely to have access to costumers, who might take on individual, non-costume jobs. If not, they should be able to give you some recommendations. Your local Yelp site can give you some recommendations and reviews as well - you might be surprised at what's available right near you, and you might end up with some custom shirts and vintage ties as well. There are vast numbers of tailors available online - some even based in Italy and Britain, where bespoke tailoring is still prized. One of the oldest Savile Row shops, Henry Poole, offers custom services ordered online. You give all your measurements, choose the fabric and then they make a pattern. Many customers are very happy with the results without a single fitting - but ideally, you are fitted along the way. It's only when a suit is actually on you that a tailor can see where to make adjustments. Tailoring is an art as well as a craft, and the best artists can make the tiniest changes that result in a masterpiece. If you can't find someone local, consider buying a men's custom silk suit when you travel. It makes for a memorable souvenir. You don't have to go to Italy or Britain, either, as Hong Kong tailors are renowned for their genius and they are much less expensive. Wherever you choose to have your suit made, you should know that a suit of this quality, when properly cared for, will last forever and look wonderful its whole life.